Combine ½ cup of sugar and 1/3 cup of water in a large saucepan and cook until a small amount of syrup will form a soft ball in cold water (240 degrees on a candy thermometer). Cook remaining 1 ½ cups sugar, 1/3 cup water and corn syrup in a separate saucepan, until it forms a hard ball in cold water (250 degrees on candy thermometer). Cool first syrup slightly. 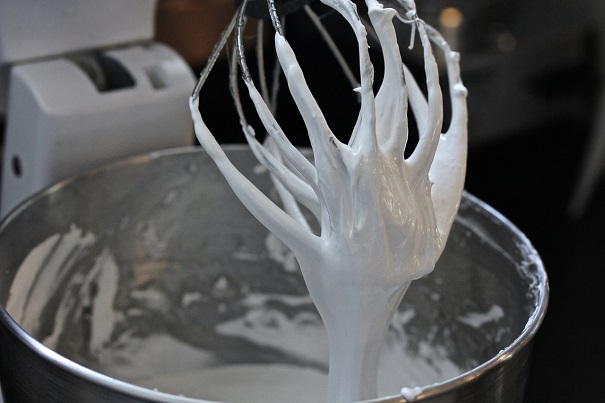 Add it slowly to the beaten egg whites, beating constantly until mixture holds its shape and loses its gloss. Add remaining sugar, water and corn syrup mixture in the same way. Add vanilla extract and turn into greased pan. 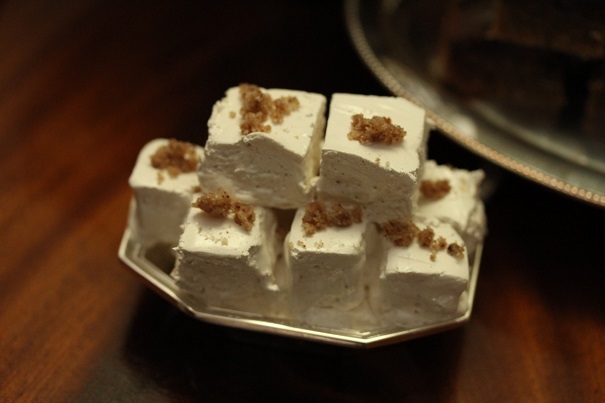 Allow to cool, then cut into small squares and sprinkle with ground pecans.